You are here: Home / News / Articles / Article / What’s Involved With Construction Staking? What’s Involved With Construction Staking? While a good plan is certainly a requirement for any successful building project, getting the blueprint right is really only part of the battle. At a certain point, you have to transform your plans into reality, and construction staking can play an important role in making that happen. Read this post to learn more about what staking is, how it’s performed, and how it can help contribute to a more successful project. Finally, you’ll learn how the services of an experienced and qualified land surveying partner can help you get the construction staking services you need. Construction staking is the process of taking planned improvements and buildings, and then actually mapping them out on the site where the building will take place. It plays a vital role in helping an organization make the leap from plans and blueprints to actual construction work. In addition to making sure that construction work is performed accurately according to project designs, construction staking can also help a project manager determine where they might be problems with a project plan. Identifying these problems at the staking phase can help save a lot of time and money for the project later on. 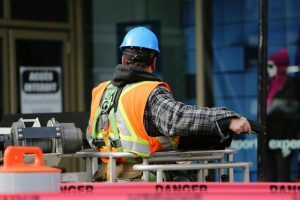 Instead of having to wait until actual construction work begins to find out about the issue, the project manager can find out about it early, so that he or she still has time to go back and adjust the building plan accordingly. As the name suggests, construction staking involves sticking stakes in the ground to map out proposed improvements. Of course, the whole purpose of staking is to position these stakes in the ground so that they match up with project blueprints with the highest degree of accuracy possible. When a land surveyor comes in to perform construction staking on a site, the project team will be expected to provide copies of all the approved project plans. Once the surveying team has these plans, they will use them to lay out stakes that identify the exact location and dimensions of all planned improvements. This could include stakes to represent the inner and outer walls of a building, the storm and drainage flow, and concrete features such as driveways, sidewalks, and curbs. As mentioned previously, each stake might be used to represent the different elements of the project. Each of these elements has to be accounted for properly within the project plan, so a good land surveyor will know how to represent this on site. In addition, there are two main varieties of construction staking available to you, and which one you choose is dependent upon on the current status of your project and the actual nature of the work being performed. The first type is rough grade staking. The purpose of this staking is simply to map out proposed improvements in relation to final elevation grade of the site. It is generally used for understanding the rough location and elevation of things like roads, parking lots and building outlines, and would take place before a grading contractor would come in to perform their work. On the other hand, site layout staking is much more comprehensive and exact in nature. This form of staking is the final placement of the horizontal and vertical location of the proposed improvements. A team would then be able to shift directly to actual construction work once the site layout staking has taken place. To get more information about construction staking or to get started planning your construction project, contact Landpoint today.